Life In Argentina: lazy mornings, lunch with friends and 7 more weeks to go! lazy mornings, lunch with friends and 7 more weeks to go! Sitting here Sunday morning next to Chris after sleeping-in till 9:30, feeling quite groggy. Why is it that when you sleep in you don't wake up refreshed? ?- I wake up feeling blobby. But I am welcomed by the space Chris makes in the morning (he wakes up like a light bulb every morning at 7 or 8am). 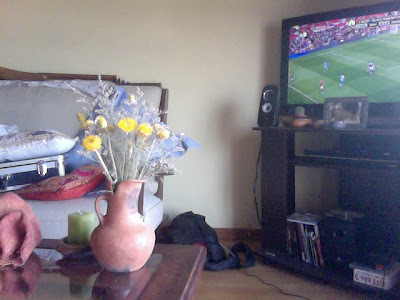 His space consists of an open laptop with live football updates, an empty cereal bowl and the TV quietly commentating the live European football or Argentinian futbol matches- always commentated in Castellano (Argentine Spanish). Mornings are Chris' time- and then I come in bleary eyed and plonk down next to him to check the world via facebook and emails. I have noticed since living abroad I have this habit of every morning opening my laptop to connect with family and friends in Australia- I don't feel right if I haven't seen people's updated status' or if a friend in Australia has written on my facebook page... I think it is sad, but I think I am also missing my Australian home like crazy. It is not a depressed missing people feeling- it is a wanting to not feel so far away/missing people feeling... if you can call that a feeling. It just seems that every morning and night I am starting the day with a square screen and going to bed after viewing the square screen.. I didn't do that before.. The ash is still plaguing the skies here in Buenos Aires. This is the 4th time it is preventing flights in or out of the airports. It is crazy, the skies are this weird overcast look, without it looking cloudy. It better not be around on the 17th Dec for when we are to fly back to Aus for the holidays! It is a big week ahead of afterschool meetings, Music concerts, Choir rehearsals. Last week was fantastic (full but great)- on Thursday after school I ran auditions for next year's Musical that I'll be directing- Mamma Mia. The kids are so excited!! Chris and I have sat down and brainstormed ideas- it will be a lot of work but brilliant fun. looking forward to opening night after all the hours of hard work from everyone! Also, here are some pictures of the IB Art Exhibition from Friday evening- The creative arts musos came together for a small jazz set of music while people walked around viewing the art- like a mini cocktail evening. It was so nice to sing again- I mean I sing all the time but not for me or not from me. Not where I am singing to tell a story or connect with other musicians or evoke emotion and express myself. It was fun! and we all went cocktail style- me in my black dress and hair all done. Fun times! (the photos are mostly for my beautiful grandparents). Love to everyone- wish I had another travel adventure to update- but normality is swinging around here. We need to clean the house a little this morning and then we are heading over to our friends house for lunch! I am teaching my beautiful friend Natalia how to make muffins and banana bread- which is not common here in Argentina!! We teach each other Spanish and English and it's great! I am blessed to have such a great friend in my life here!